Explore Buffalo is recruiting volunteers for Doors Open Buffalo, taking place on June 15, 2019. Doors Open Buffalo is a day of free public access into downtown Buffalo’s most architecturally and historically significant buildings. Based on Doors Open events in other cities like Baltimore and Pittsburgh, we are expecting up to 15,000 people to visit the 35 buildings on tour. We will need hundreds of volunteers to staff this event. Volunteer duties include greeting and counting visitors, distributing event guides, and providing directions and a basic history of your assigned building. Monkey See, Monkey Do Children’s Bookstore is looking for volunteers at the Buffalo Marathon on Sunday, May 26, 2019! They have a variety of opportunities available. Please contact Kim Krug at kim@monkeysread.comsread.com or 716-713-5472. 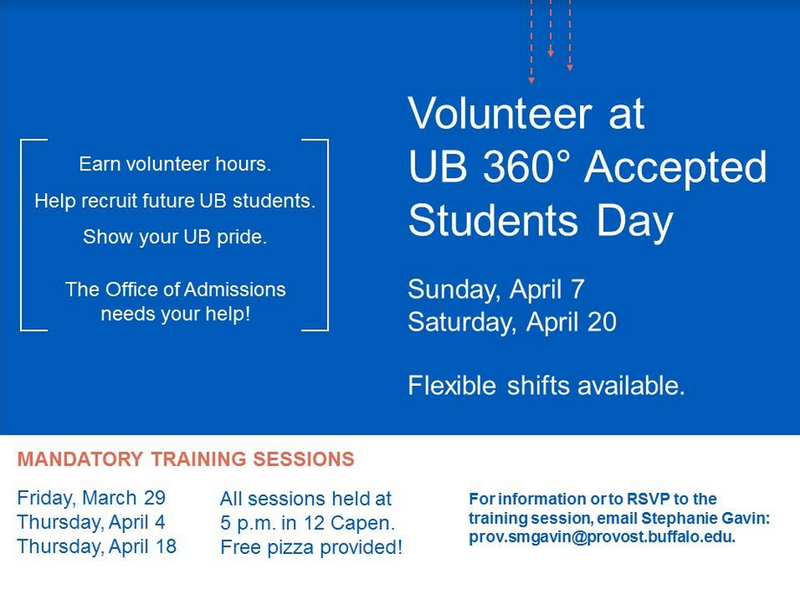 Volunteer at UB 360 Accepted Students Day! Raise money now to help fight cancer! AAUW, the American Association of University Women, is a national organization advocating for equity and education for women and girls. Locally, the Buffalo branch – sixth oldest branch in the country—provides scholarship and interest-free loans for women and men. The branch will host its thirteenth anniversary Tech Savvy conference on Saturday, March 16, at the University at Buffalo North (Amherst) campus. Tech Savvy inspires middle school girls to pursue careers in STEM (science, engineering, technology, and math) areas through fun workshops. The on a roll program provides follow-through sessions for high school girls. And, adult sessions feature topics for parents, teachers, and other adults. This year’s theme is She Inspires, I Inspire, We Inspire! Tech Savvy Buffalo is the flagship program for the national Tech Savvy program, with dozens of sites nationwide since 2014. Along with support from AAUW, the conference is made possible due to support from Praxair and UB’s School of Engineering & Applied Sciences. The program is run by approximately 100+ volunteers. Volunteers are needed to help with set up, registration, room monitoring, ushering, and snack services. Volunteers are needed for the full conference (7AM – 5pm) or for morning (7 AM – 1pm) or afternoon (noon – 5pm) shifts. Volunteers will receive continental breakfast, lunch, and t-shirt. Volunteers are also invited to the pre-Tech Savvy reception on Friday, March 15. Recent college graduates (within last two years) who volunteer can receive a complimentary first year national AAUW membership. · Please also let us know how you heard about this conference / volunteering. Loyal Blue Day is a celebration of UB alumni and friends that make gifts to support students. The goal is to thank donors and teach students about the ways philanthropy enriches their education through scholarships, experiential learning, technology, facility upgrades, etc. Student volunteers are needed for the Loyal Blue Day stations at the Student Union on North Campus and Harriman Hall on South Campus from 10 a.m. – 2 p.m.
All volunteers will receive a free t-shirt for their 2-hour shift. Volunteers will simply be asked to recruit students to the Loyal Blue Day table to write thank you notes to donors. It’s very simple, and it will be a fun atmosphere with games, prizes and food. Relay for Life is the largest on campus fundraising event that raises money for the American Cancer Society throughout the year. We’re reaching out to you to ask if you’d join us at this year’s Relay for Life which is April 12, 2019 at 6 PM on UB’s North Campus. The theme for this year’s relay is superhero, where we’re IncrediBULL and fighting cancer like superheros. We’d love it for your club to join Relay for Life and raise money throughout the year for this great cause. I’ve attached the link for registering a team below and after registering your team, your club members can register under your team name. If you have any questions or comments, you can reach out to me (contact information below) or to our club email ubrelayforlife@gmail.com. We look forward to seeing you at Relay for Life this year where we’ll all be fighting cancer!